41033 Fripp Nearshore No recent reports. 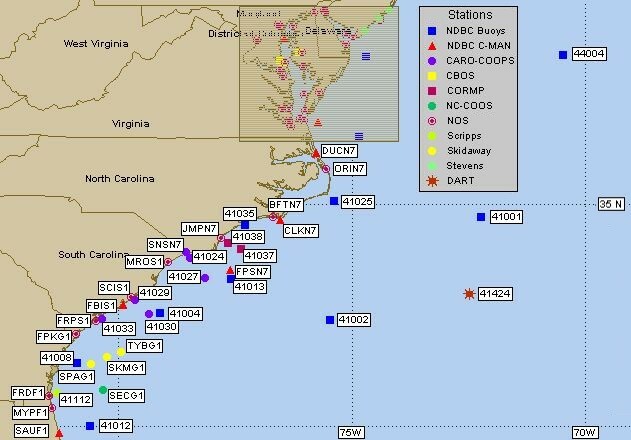 SCIS1 South Capers Island, SC No recent reports. 41424 370 NM East of Charleston, SC No recent reports. 41027 Sunset Mid-Shelf No recent reports. FRPS1 Fripps Inlet, SC No recent reports. 41030 Capers Mid-Shelf (CAP 3) No recent reports. 41029 Capers Nearshore (CAP 2) No recent reports. 41013 FRYING PAN SHO No recent reports. 41001 Cape HATTERAS No recent reports. FBIS1 Folly Island, SC No recent reports. 41004 EDISTO No recent reports. 41002 S HATTERAS No recent reports. FPSN7 Frying Pan Shoals, NC No recent reports. DUCN7 Duck Pier, NC No recent reports. MROS1 Springmaid Pier, SC No recent reports.